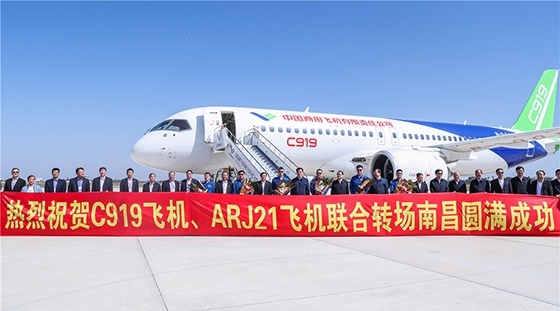 C919 and ARJ21 aircraft fly to Nanchang for flight test__Commercial Aircraft Corporation of China, Ltd.
A group photo taken on October 27th, 2018. 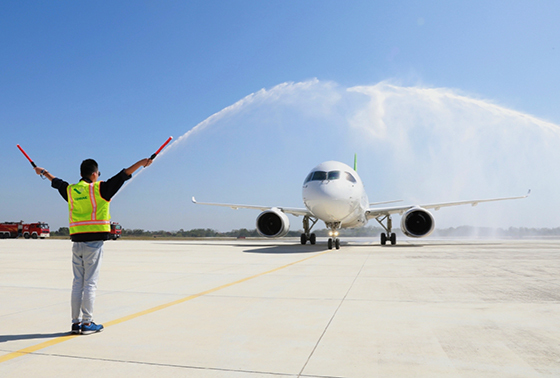 The second C919 aircraft took off from Dongying Shengli Airport in Shandong province, and landed at Yaohu Lake Airport of Nanchang in Jiangxi province at 11:09 a.m. after a flight of 2 hours and 6 minutes on October 27th, 2018, successfully completing the ferry flight. Prior to this, two ARJ21 aircraft had flown to Yaohu Lake Airport to carry out adaptability inspection and make preparations for the subsequent delivery flight test. After this ferry flight, the China-made aircraft would carry out flight test at Yaohu Lake Airport of Nanchang. This airport would provide professional flight test site, flight test airspace and other support resources for the China-made aircraft. In the process of promoting high-quality and great-leap-forward development of the economy, CPC Jiangxi Provincial Committee and Jiangxi provincial government had always put aviation industry in a prominent position, clearly proposed to utilize the force throughout the province to realize the "Aviation Dream" of Jiangxi, i.e. "making the aviation industry prosperous, the aviation research and development strong, the aircraft of Jiangxi province fly, the aviation town thrive, and the aviation market blossom", been committed to build a "four-in-one" whole aviation industry chain of "aircraft manufacturing, civil transport aircraft, general aviation and airport economy", and pushed forward the construction of Nanchang Aerospace Industry Town centering on the trunk liner program to promote the development the trunk liner career of China. Yaohu Lake Airport, which was put into service in 2018, has an airline distance of 610 km from Shanghai, has a runway which is 3,600 m long and available for flight test, and has exclusive flight test airspace. Meanwhile, AVIC Jiangxi Hongdu Aviation Industry Group Corporation Limited owns professional teams covering the overall process of flight test, relatively complete test means, and adequate maintenance and ground service support teams and facilities, and can provide sufficient guarantee for the flight test of trunk liners. AVIC Hongdu will fulfill the construction of zones such airport operation, research and development test, and large aircraft subcontracting industry in Nanchang Aerospace Industry Town in the future. 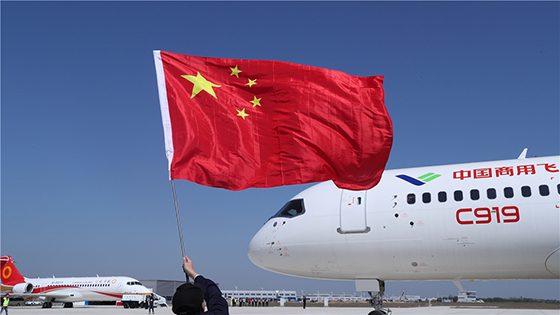 The industry driving effect of China-made aircraft programs has appeared preliminarily, injecting new vitality to economic development as well as the scientific and technological innovation of Jiangxi province. There are several aviation enterprises in Jiangxi province participating in trunk liner program, among which AVIC Hongdu is responsible for the research and development of C919 fwd fuselage and mid-aft fuselage; and AVIC Changhe Aircraft Industry (Group) Corporation Limited is responsible for the manufacturing of C919 leading edge slats and flaps. Commercial Aircraft Corporation of China, Ltd. (COMAC) have developed technical cooperation with China Helicopter Research and Development Institute (CHRDI) in the aspects of structure and strength design of composite aft fuselage, wind tunnel model machining of configuration management technology, etc. C919 AC102 went through the "water gate" on October 27th, 2018. 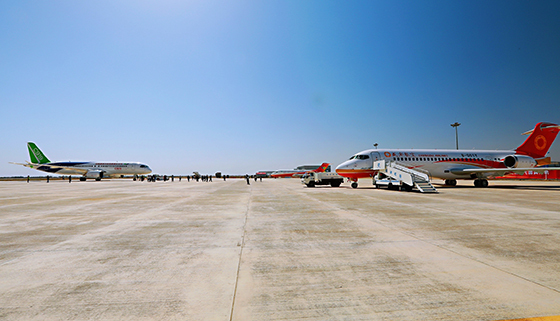 A photo of C919 and ARJ21 aircraft.